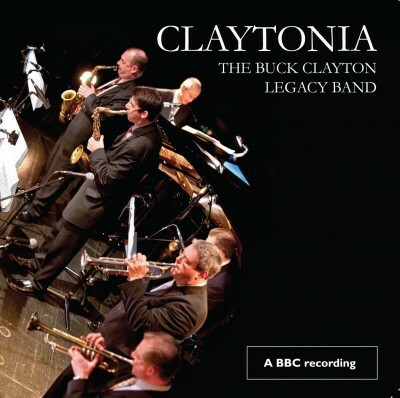 The Buck Clayton Legacy band is currently playing three projects – starting with a selection of Buck’s music bequeathed to Alyn Shipton and played at many concerts and festivals including Breda, Oberhaching, Upton-On-Severn, Gateshead, the EFG London Jazz Festival, Swansea and the Bristol Jazz Festival; currently the band is also touring “Buck and Billie” the Billie Holiday Project, with Julia Biel; and (launched at the EFG London Jazz festival in 2014) a Celebration of Duke Ellington. The great swing trumpeter Buck Clayton made his reputation in the cut-throat jam sessions and all-night blues clubs of 1930s Kansas City. In later years, he kept the traditions of the great “blues shouters” alive by touring Europe and the UK with his own octet, along with such singers as Jimmy Rushing, Big Joe Turner and Jimmy Witherspoon. 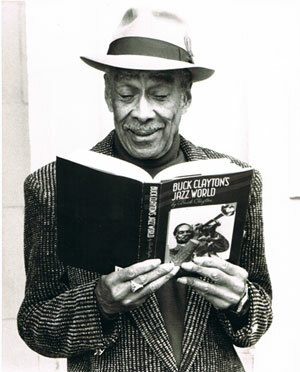 The Buck Clayton Legacy Band, formed in 2004 by bassist Alyn Shipton and saxophonist Matthias Seuffert to re-explore Clayton’s music, delves into that Kansas City Legacy. They turn their concerts into a speakeasy in the grand tradition of the Reno and Woodside Clubs immortalised by Count Basie. At the 2013 Cheltenham Jazz Festival, at Dame Cleo Laine’s Wavendon Garden Season, and at both the 2015 and 2016 Swansea Festival of Music and the Arts where they played for dancing, they were joined (to cover Buck’s arrangements for Jimmy Rushing and Joe Turner) by the celebrated American blues singer Michael Roach, himself a resident of Cheltenham, and a living repository of blues history. 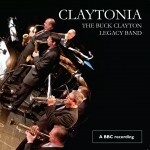 The Band’s CD CLAYTONIA was launched on 1 July 2013. THE DUKE ELLINGTON SHOW was premiered at the London Jazz Festival, and subsequently played at Sage Gateshead (along with an Ellington workshop) and SJE Arts in Oxford. 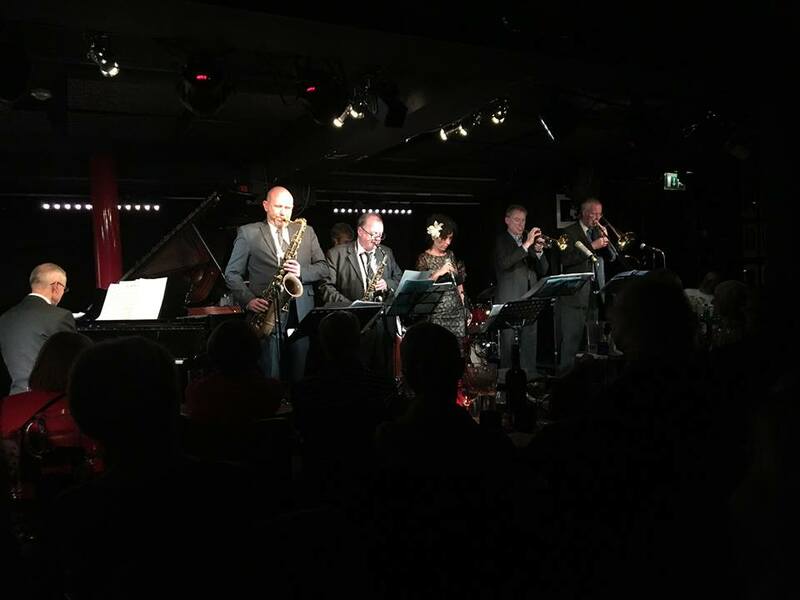 It was at Swanage Jazz Festival in summer 2016, at Pinner on 1 April 2017, at Watermill Jazz in Dorking in August 2018, and in Henley on October 2018. There will be further concerts of this repertoire in 2019 at the jazz festivals in Pershore and Ushaw. 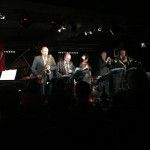 THE BUCK CLAYTON repertoire was the central feature of the 2015 Oberhaching Classic Jazz Festival near Munich, and also featured at the 2015 Upton on Severn Jazz festival on 26 June 2015. The band played this repertoire at the Pershore Festival in August 2016 with a Buck Clayton memorial concert, and it was the focus of the band’s European concerts in November 2017: in Bielsko-Biala, Poland, and then in Switzerland at Bülach and Thalwil. The band will bring this music to the Hot Club of Limoges in December 2019. “Buck and Billie” was at the Watermill Jazz Club Dorking on 8 January 2015, as in this picture with Gwyneth Herbert, who originally launched the programme, after touring for two years with the band playing the music associated with Peggy Lee. Now performing this programme with award-winning singer Julia Biel, including concerts in London, Pershore and Durham, the show was at Turner Sims Southampton in October 2018, SJE Arts in Oxford in November 2018 and at Pizza Express Soho in December 2018. The first 2019 show is at the Cheltenham Jazz Festival on 2 May. 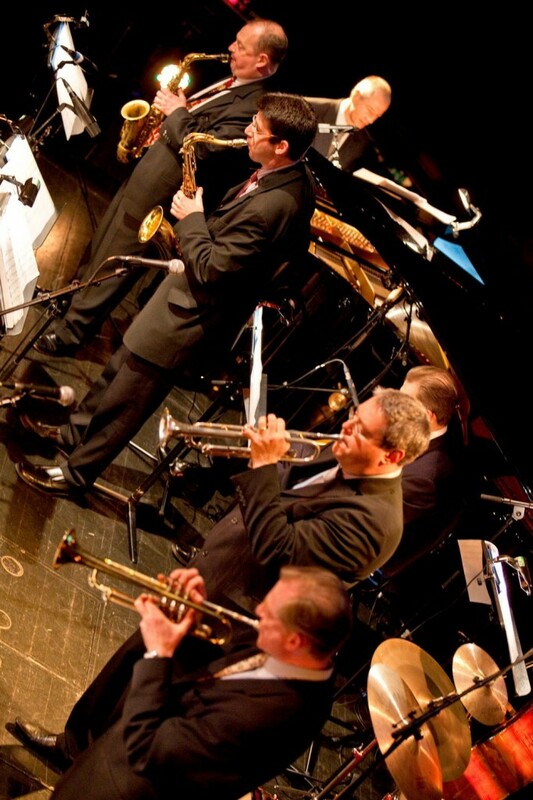 “There’s said to be a minor resurgence in swing in the metropolis, with new bands popping up, and that’s all to the good. Still, for the real thing, you needed to be on hand to hear the mighty Buck Clayton Legacy Band storm into ‘Outer Drive’. Arranged by band trombonist Adrian Fry, this had all the ensemble cohesion and rhythmic certainty that its original composer, Basie trumpeter Buck Clayton himself, would have relished. Clayton knew how to give his pieces an inbuilt propensity to swing, but as band altoist Alan Barnes said to me, ‘I can think of plenty of bands who’d still miss out.’ Happily this one, propelled by the peerless Bobby Worth, our finest swing drummer, who formed a tight rhythmic bond with bandleader-bassist Alyn Shipton, never put a foot wrong. 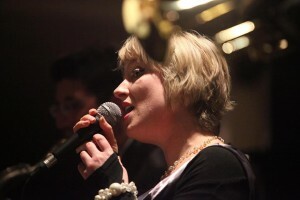 The meat of the night came with the ‘guest’ appearance of vocalist Lady J (Julia Biel), whose role was to evoke and emulate Billie Holiday, especially on songs with a Clayton association…Her second set excelled, the confidence building, the backing scaled-down, as on ‘God Bless The Child’.” Peter Vacher, Jazzwise. The musicians: Matthias Seuffert, reeds and Alyn Shipton, bass (co-leaders); Menno Daams and Ian Smith, trumpets; Alan Barnes, reeds; Adrian Fry, trombone; Martin Litton, piano; Martin Wheatley, guitar; Bobby Worth, drums. For the Ellington show the band is joined by Robert Fowler or Karen Sharp, reeds.